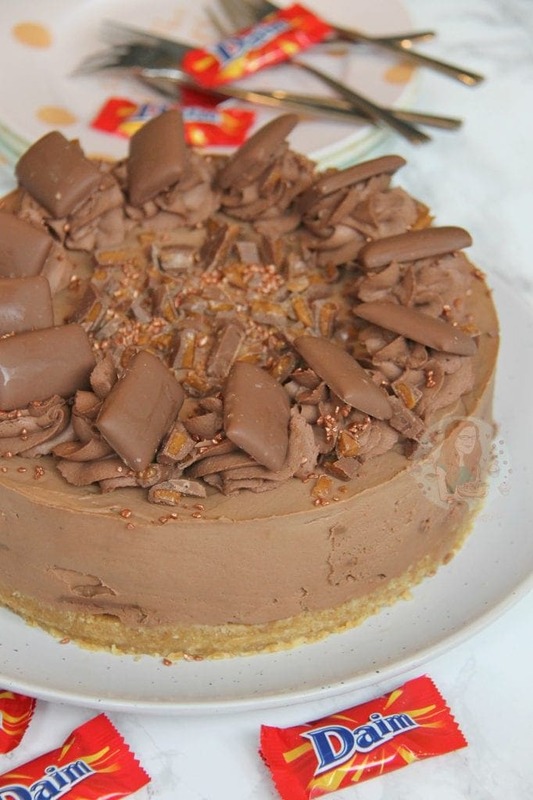 A Chocolatey, Caramelly & Almond No-Bake Cheesecake, all based around the wondrous Daim Bar. 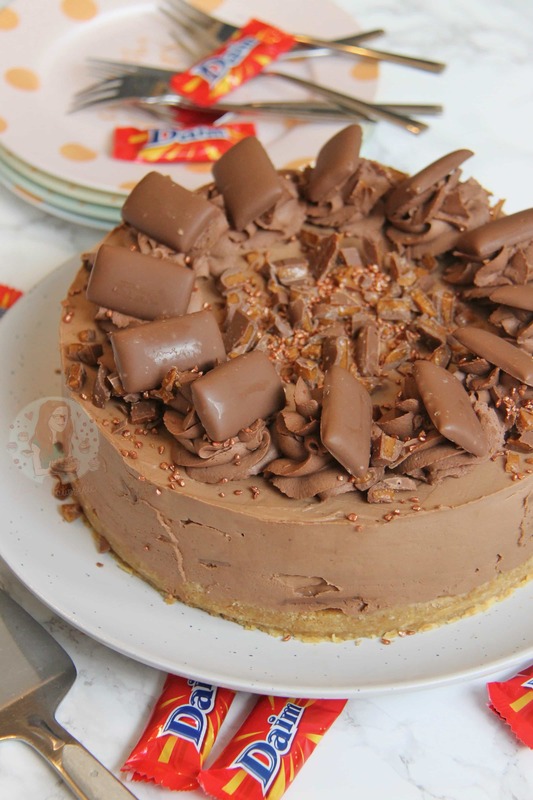 My Daim Bar Cheesecake is definitely one of my FAVOURITES! Daim Bars are one of those sweet treats that you either love, or have never had. I have had oodles of them from the occasional trip to IKEA when I was younger – but I will admit that I have neglected them over the years for other chocolates, till I was asked to create this delicious recipe from one of my regular readers. Daim Bars are a crunchy caramel almond butter bar, covered in milk chocolate. They’re naturally thin, and can come in whole bars – but my favourite is the bags of the mini ones. That way, I can eat a few of them without feeling guilty 😉 I decided that the best way to make this into a cheesecake was to follow in the footsteps of my No-Bake Toblerone Cheesecake and my No-Bake Honeycomb Crunchie Cheesecake – Making a chocolatey base of a cheesecake, and folding through the sweets! 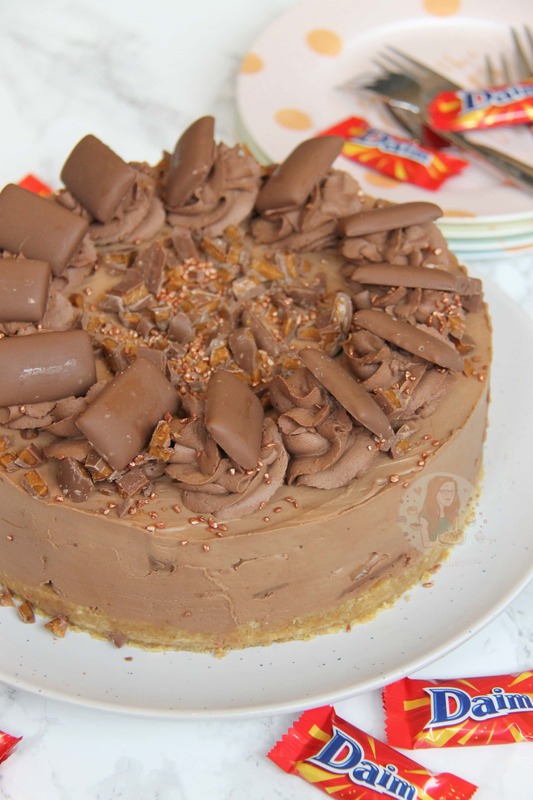 The base of the cheesecake has almonds in, to fit with the flavour of the Daim Bars, but the almonds are optional. I decided with this recipe that I would use a mixture of Milk & Dark chocolate in the main cheesecake filling because I like the mixture of the two chocolates – it makes it a richer flavour without being too filling still, and folding through the chopped up Daim Bars makes it have the ever so slight hints of almond and caramel, without being too overpowering. Unlike most of my other cheesecakes however, I used some of the filling to decorate as I though a chocoholics heaven would be best! Delicious. 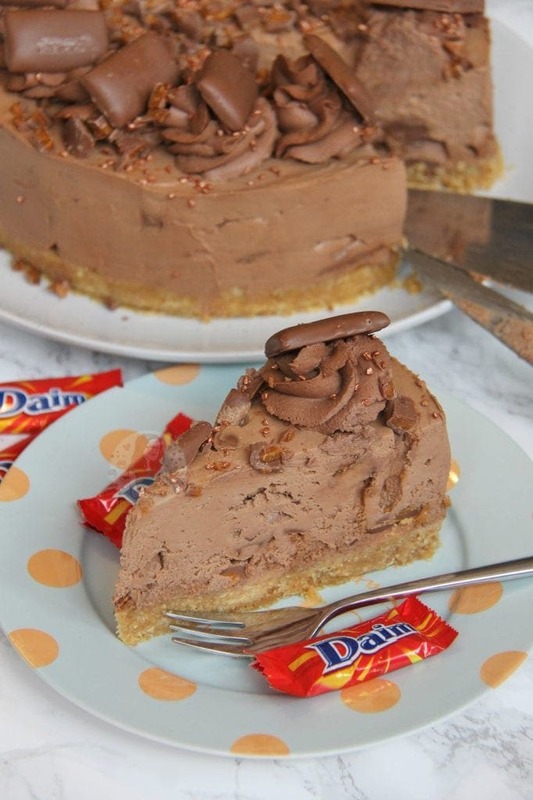 I must admit, this cheesecake is delicious – and if you love Daim Bars you will love this too. Let me know how you get on – enjoy! 1) To Make the Biscuit Base – Blitz the biscuits and the almonds in a food processor to a small crumb, add the melted butter, and pulse a few times until it is combined well. Tip into a 8″/20cm Deep Springform Tin and press down firmly – chill in the refrigerator whilst you do the rest! 3) With an electric mixer (I used my KitchenAid) Mix the Cream Cheese, icing sugar, vanilla extract and almond extract together until smooth. Whilst mixing, pour in the melted chocolate and Whip again until VERY thick. Mix with a spatula quickly to make sure its all combined well. 4) Whilst slowly whisking, pour in the liquid double cream and continue to whip the mixture until very thick – It will hold it self completely when finished whipping. You can alternatively whip the cream separately and fold it through the cheesecake/chocolate mixture. 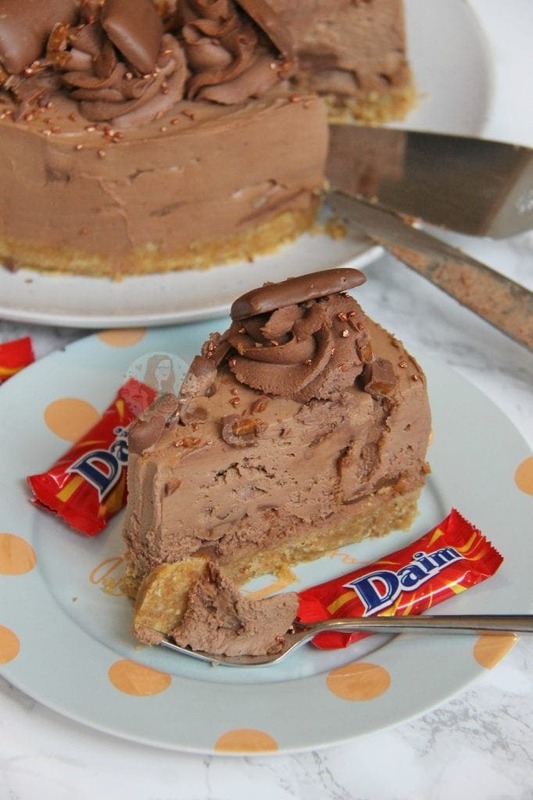 5) Chop up the Daim Bars and fold through the cheesecake mix – pour onto the biscuit base and spread evenly. Leave to set in the fridge, covered, for 5-6 hours, or preferably over night! 6) To Decorate – Whip together the double cream, icing sugar, and cocoa powder until very thick. Using a Piping bag and a 2D Closed Star Piping Tip, pipe on the chocolate cream to decorate, and place a mini Daim Bar on each of the rosettes! 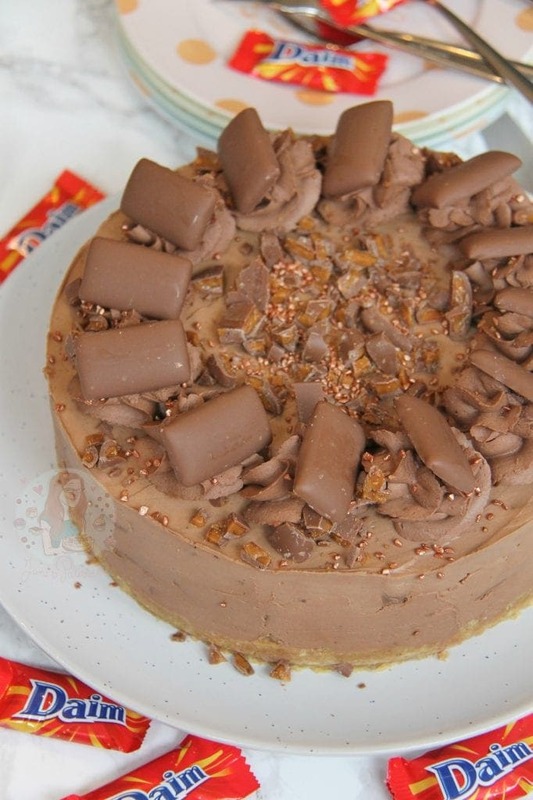 Sprinkle on some chopped Daim Bar, and some sprinkles and enjoy! You don’t have to use the almonds in the base, but as a Daim Bar is an almond/caramel sweet, it does suit the flavour really well! (However, I don’t find the Almond in the Daim bar comes through that strongly itself, so if you don’t like almonds – you will still be fine with this cheesecake!) But if you’re not using the almonds in the base, still use the 300g of biscuits – no more. I always set my cheesecakes in the fridge overnight otherwise they risk not being set enough! I would also 100% recommend using Full-Fat cream cheese and cream if you’re going to be taking it out of a tin, and not setting it in cups for example as it needs the fat content to set! Older Next post: Top 10 Tips for Blogging! Newer Previous post: Giant Skillet Brownie! Hi Jane, Can the cheesecake still be made without the chocolate and dark chocolate (to make it a simpler taste?) Thanks! This recipe was a amaking. I love Daim candy. This looks great. I hope to make it soon. Me too! Thanks Chris – please do!